Where can you go for great bird watching? Head to this local bird watching spot. 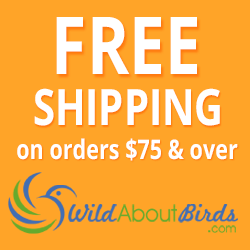 Want to attract gorgeous red cardinal birds to your yard? It's easier than you think! What do cardinal birds like? Check out these simple tips to help you attract cardinals. Cardinals are easily attracted to the right feeder stocked full of bird food. They are often the first birds you will see at your feeder in the morning and one of the last to leave in the evening. When choosing a cardinal bird feeder, it's important to make sure cardinals will have a strong and sturdy place to perch. Small feeders and tube feeders aren't a good choice for these large birds. Cardinals are heavier than many other backyard birds, and look for sure footing when they are feeding and nesting. Cardinals are most comfortable on a hopper or platform feeder. They can often be found eating seeds dropped from a dainty little bird feeder above. If you have a squirrel-proof feeder that is adjustable, make sure your feeder's spring is put on a setting that still allows cardinal birds to get to the bird seed. Hang your bird feeders where they are easy for you to get to for easy re-filling. If you let your feeders remain empty too long, cardinals may search for more consistent food somewhere else. Northern cardinal birds are not terribly picky eaters so a wide variety of seeds, nuts or even fruit can serve as cardinal bird food. Whether you offer them inexpensive sunflower seeds, safflower seeds, suet or even broken up peanuts – stocking a feeder year-round with cardinal-attracting snacks is a good way to make your yard more cardinal friendly. Cardinal birds will also eat mealworms you put out to attract bluebirds. It would be a real treat to see a bluebird and a cardinal at a mealworm feeder at the same time! You can feed cardinals many different kinds of fruit too, including apple slices and fresh berries. A wild bird feeder that has a place for grape jelly or fresh fruit is sure to attract fruit-eating birds like the northern cardinal. 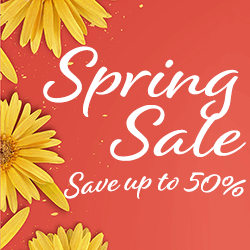 Finally, if you are able to add plantings in your yard to attract cardinals, look for berry-producing trees and bushes including mulberry trees and blueberry bushes. Cardinals are attracted to dark colored berry bushes. In many areas northern cardinals stay around throughout the winter, adding a nice burst of color and the sweet sound of music to your back yard all year long. Natural plantings can help give them shelter in the winter, as well as providing a food source (if you have berry-producing bushes). When it comes to finding shelter and making their nests, northern cardinals are very private birds. They look for areas that are dense with growth, like evergreen trees or thick shrubs. Perhaps because of their bright colors, cardinals make their homes inside dense greenery. Plant evergreen trees or shrubs: If you want to attract cardinals to your yard, you might also consider planting thick greenery that they can use as a protected area in which to nest. Offer nesting material: It's easier than it sounds. Just put pieces of dog fur, yarn or other lightweight materials out. An empty suet feeder is the perfect place to hang nesting materials. Hummingbirds and cardinals, two of the most popular backyard birds, make their own homes and won't nest in bird houses. Offering nesting material can be a great way to get these birds to nest nearby. 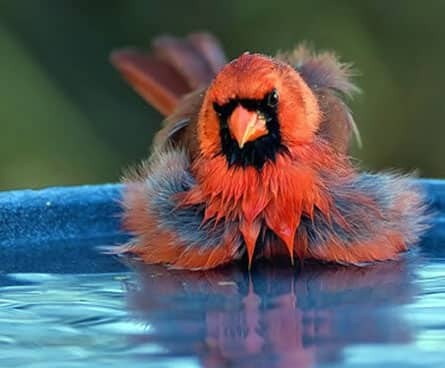 Provide fresh water: Like all birds, cardinal birds love water. They drink it, bathe in it and will often splash around in it. 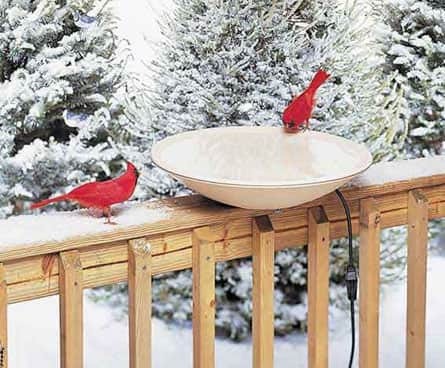 If you have a birdbath in your yard, cardinal birds are more likely to stay close to the water when they search for nesting sites. To give your cardinals a little extra security in the water, add a small stick or two to your birdbath. It will give the bird a comfortable place to rest while it drinks or after bathing. Little touches like these can help attract and keep northern cardinals in your back yard all year long! Northern cardinal pairs begin building their nests in the spring. It can take up to 10 days for the female to build the nest, and when she's done it has a nice cup shape to it. Cardinals may have several broods each year but rarely reuse a nest, so if you locate an empty cardinal bird nest look around — you may find another nest that the female cardinal has made for her new family. Both male and female cardinals sing, so if you are lucky enough to attract a pair of cardinals to your yard, you can enjoy the sweet music each one makes! While most vocal during their breeding season, you can hear cardinals year-round. When they are singing, you are much more likely to find cardinals higher up in the trees. Keep your eyes open as you never know where you might see a bright red male cardinal. There are so many things that make the Northern cardinal a wonderful bird to have in your yard. From their beautiful songs and bold colors to their year-round visits, once you attract a few cardinals you'll find all sorts of reasons to encourage them to stay. They are frequent visitors to bird feeders, so you may even want to add a feeder or two filled with their favorite treats. Photo Credit: Cardinal at Hopper and Cardinals Flying by WildAboutBirds.com photographer Judy_NMMI, Cardinal Pair by ltshears, Cardinal on Limb by lightpoet via Depositphotos.com, Cardinal Splashing by wfrieck, cc.